Volunteers care for a panel of The AIDS Memorial Quilt at the 2012 Smithsonian Folklife Festival. Each day of the Festival, volunteers unfolded The Quilt on the dirt, grass, and dust of the National Mall. Visitors may have been shocked that caretakers and hand maidens of The Quilt would allow potential damage to befall the delicate panels so carefully crafted for those lost to AIDS. But The NAMES Project Foundation stresses that the wear caused by contact with the ground and with the public is natural, not disrespectful. “It is a living thing,” said Quilt caretaker Gert McMullin, “We want people to touch it, interact with it, and cry with it. It belongs to the community.” Exposing the panels to the public, the elements, and the world ensures that the memories of panelists’ loved ones endure and remain in the public eye. The continual repair that The Quilt undergoes emphasizes the fact that healing is a collective process furthered by a community willing to help. Participant Father Joseph “Rick” McCormack repairs a panel of The AIDS Memorial Quilt at the 2012 Smithsonian Folklife Festival. Symbolically, The Quilt’s sheer size and mass reflect the weight of memory and grief. Quilts are also traditional symbols indicative of childhood, family, and love. NAMES Project staff member Jada Harris emphasized the relevance of utilizing a non-threatening quilt as a medium of expression for memorializing and comforting. “It was brilliant for the founders to choose The Quilt as an icon…who is going to be repelled by a quilt? 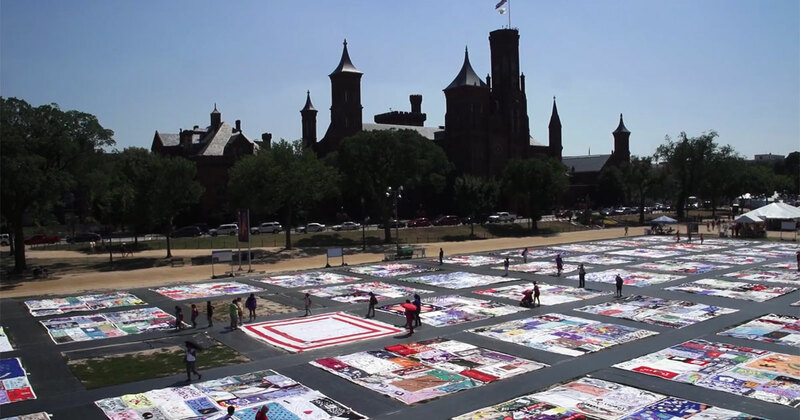 It’s warm, fuzzy; it’s what your grandmother makes.” As a tangible piece of fabric, The AIDS Memorial Quilt provides comfort for those who survived. As a democratic memorial, it provides a testament to each individual life, equally integrating the memorials of millions of Americans. The Quilt’s materiality has also been the subject of an enormous digital undertaking for improved access and interaction. In partnership with The NAMES Project Foundation and the University of Iowa Digital Studio for Public Humanities, Anne Balsamo’s team at the University of Southern California has worked to create a virtual database of the entire AIDS Memorial Quilt. Every panel, every block can be searched by name, number, and current display location. “We are somewhat of digital Quilt archaeologists,” said Balsamo. “We wanted to use technology in service of material culture...bridging the physical and virtual for improved public engagement and preservation.” The team hopes that in addition to being a resource for panel makers, the database will be utilized to trace historical patterns, trends, and ideas within the context of visual culture and the HIV/AIDS pandemic. The 2012 Festival celebrated how the materiality, symbolism, and ability to interact with The Quilt showcased the efficacy of art as an almost universal language, a creative translation when words fail. The Quilt is both culturally loaded and entirely secular, an open space for people to grieve and remember in their own personal way. Katie Cardenas was an intern for the 2012 Smithsonian Folklife Festival on the Creativity and Crisis: Unfolding The AIDS Memorial Quilt program. She is a graduate of Vanderbilt University, where she studied Anthropology, Global Health, and Spanish.